OTEC or Ocean Thermal Energy Conversion is a technology that has been around as a theoretical possibility since the late Nineteenth Century, and there have been a few prototype plants over the years. This week in Hawaii a small scale (50KW) plant opened. This is still more research and development than commercial scale operation but it is another step in the right direction. I’ve blogged before about large scale marine source heat pumps. 3 weeks ago I wrote about Star Renewables and their project in Drammen Norway that is the major heat source for the town of 63,000 people, and in June 2014 I blogged about the National Trust installing a marine source heat pump at Plas Newydd in Anglesey. OTEC is in a way like a marine source heat pump, but utilizing the temperature difference between hot surface ocean waters and cold deep ocean waters to boil and chill a fluid such as ammonia with a very low boiling temperature, so generating stream and driving a turbine to produce electricity. 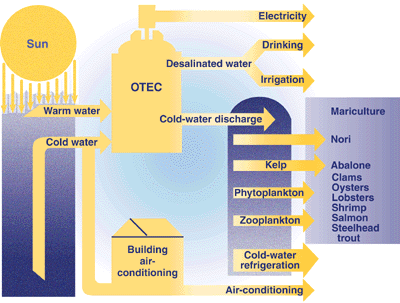 As the diagram above shows OTEC has, at least in theory, many possible spin off uses that could be very beneficial. 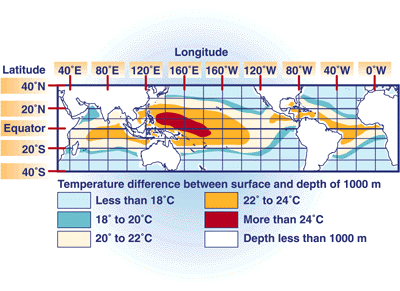 OTEC works best where there is the greatest temperature difference between hot surface water and cold deep ocean water, and as the map above shows it is in the Pacific Ocean roughly between Japan and Hawaii that this technology will work best. Perhaps, unsurprisingly, the two leading research centres for this technology have been in Japan and Hawaii, and both have prioritised renewables as a major part of their energy economies. Makai Ocean Engineering built the new Hawaii plant, do check-out their website where there’s a good video explaining the technology. This entry was posted in Energy on 29 August 2015 by Richard. 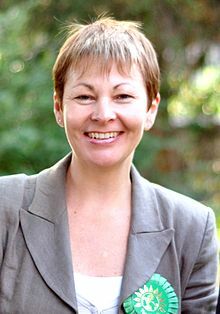 Yesterday the Green Party MP for Brighton Pavilion, Caroline Lucas, wrote an open letter to Jeremy Corbyn proposing a pact of the progressives. An excellent letter: interesting to see how Corbyn responds! This entry was posted in Politics on 25 August 2015 by Richard. Modern cities need good public transport systems. As diesel buses are responsible for much air pollution they’ll need to be replaced with cleaner technologies. London has long had an electric underground, and many cities have electric trolley buses, using overhead power lines. Some British cities are building electric tram lines, emulating their European counterparts. Other options are now emerging as both hydrogen fuel cell and electric battery technologies are improving. London has about 8,700 buses, mainly still diesel. These are increasingly being retrofitted to reduce nitrogen oxide emissions. Diesel electric hybrids are increasingly common, and perhaps a dozen or so all electric single decker buses now operate in the city. In October London is due to get its first all electric double-decker bus, looking very like a Routemaster; it is being built in China by BYD. China is the world leader in battery electric bus manufacture and deployment. Various Chinese cities are forging ahead with a range of zero tailpipe emission transportation systems. For many years there had been talk of a hydrogen fuel cell revolution, and now slowly it’s beginning to take shape. 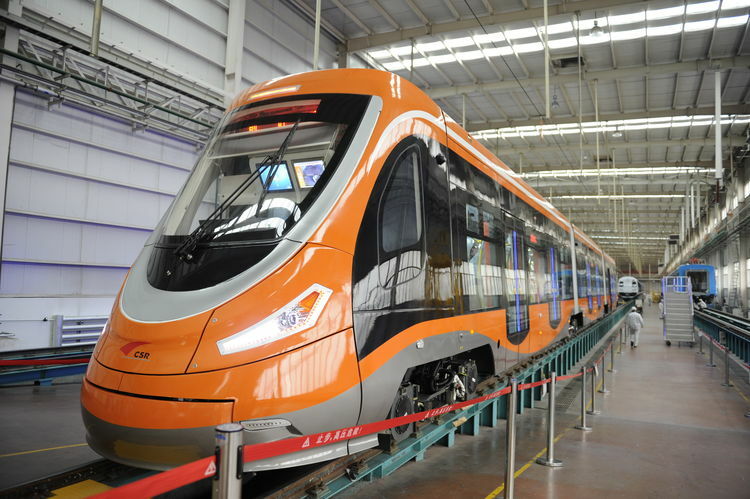 The photo above is of the world’s first hydrogen fuel cell tram, built in Qingdao, China, by Qingdao Sifang. China has very impressive plans to roll out zero emission transport systems to many of its cities. Hydrogen fuel cell trams, ordinary electric trams and battery electric buses are all set to become common sights across China in the next few years. As this is achieved the air quality in Chinese cities should rapidly improve. At the same time investments in renewable energy technology, and in energy efficiency, should ensure that the worst coal power stations can be closed, and at last the upward climb of Chinese carbon emissions can be halted, and hopefully reversed. This entry was posted in Transport on 24 August 2015 by Richard. The Fossil Fuel Age is drawing to a close. Climate Change dictates that it must. The question is do we as a species grab the opportunities and embrace the massive changes that need to be made, or do we try and hang-on to the old polluting ways of doing things. The arc of history is slowly swinging towards quitting fossil fuels, but the question is, will we do it sufficiently quickly to avert the worst of Climate Change. And let’s not be under any illusion, the old incumbents of the fossil fuel economy and their political poodles are fighting tooth and nail to keep the status quo, to keep polluting if there’s any hope of making money. So, the bad news this week is that the British government is pushing ahead with fracking on a massive scale. It’ll make them as popular as the Poll Tax did Thatcher. Even more bonkers, the Saudi’s have ramped up oil production to 10.6 million barrels per day, which with oil prices at about $42 means they lose money on every barrel they produce, all in the hope of securing market share, regardless of what all this oil is doing to the planet’s climate, upon which we all depend. However on a positive note there is much going on. The Islamic Climate Declaration has just been issued from a conference in Istanbul, strongly echoing the Papal Encyclical. It calls on the world to switch to 100% renewables. Interesting to see how that goes down in Riyadh! Meanwhile Dr James Hansen, fresh from his victorious legal action against the Dutch government for failing to take action on Climate Change has now, along with 21 young plaintiffs, taken the government of the USA to court in Oregon. 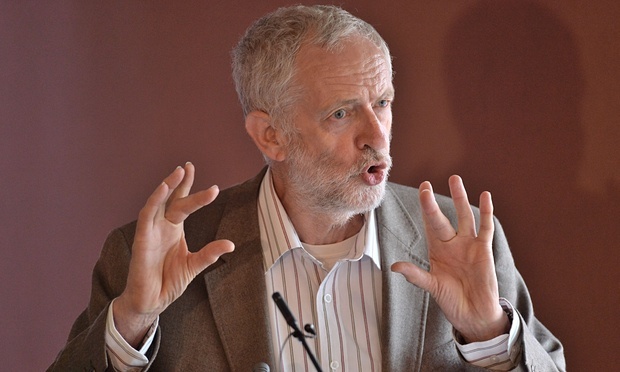 Back in Britain Jeremy Corbyn has issued a 17 page document on Climate Change and the energy transition. It’s an excellent document, very clear and well written. Press coverage of it has been appalling: journalists and fellow politicians have criticized it, clearly without reading it, or wilfully misinterpreting it. Also this week I’ve come across more great stories from the world of technical innovation in the renewable energy sector, but that’ll have to be a separate blog! This entry was posted in Climate Change, Energy on 19 August 2015 by Richard. Lots of people I meet in the Transition Towns movement and elsewhere talk a lot about Peak Oil. The argument goes that as geological reserves become exhausted oil demand will exceed supply and prices will go up, causing economic chaos and even wars. There has been much speculation whether oil addiction was a determining cause of the American led invasion of Iraq. To me climate change was always the main reason why we needed to quit fossil fuels. Proven reserves have long been known to be five times more than enough to cause climatic catastrophe. However the Peak Oil people would respond by saying that the easy to reach resource had been used up and the cost of newer sources would be very much higher. With oil rising to $146 per barrel back in the summer of 2008, and seeming to be on an upward trend, this looked like it might be the case. Today the oil price is at $42 per barrel, and talk is of it falling to below $40. Why has this happened? There are many factors. Political factors like a downward bidding war amongst OPEC producers, and the imminent re-emergence of Iran as a major oil exporter as sanctions are lifted, are important. Technological factors are also playing a part. Fracking has, in the short term brought down the price of gas, and renewables are beginning to bring down the cost of electricity, and enhanced oil recovery is bringing down the price of oil. Miraah, the world’s first large scale solar powered enhanced oil recovery project is just being built in the Amal oilfield in the deserts of Oman. 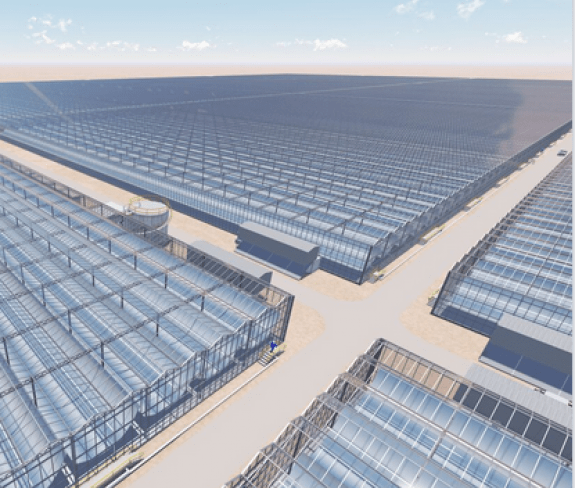 Glasspoint, a Californian start-up has designed a super light weight aluminium parabolic trough system that operates within a protective greenhouse. It will supply solar generated steam to force oil out of the ground, effectively increasing the oilfields economically recoverable reserves. Personally I’d like to see humanity quit fossil fuels as quickly as possible. We need to anyway, of course, due to climate change: so no need to worry about Peak Oil. Then we could use the Glasspoint technology to generate steam for more useful things, like generating electricity, desalinating seawater or directly driving industrial processes. This entry was posted in Climate Change, Economics, Energy on 14 August 2015 by Richard. Most of the debate around renewable energy is focused on electricity generation. However in most industrialised countries electricity only accounts for about 25% of energy total energy use: transport accounts for another 25% and heating and cooling for a massive 50%. Reducing or eliminating the use of fossil fuels for heating and cooling is critically important as we seek to lower carbon emissions, cut air pollution and dependence on imported fuels. I’ve blogged about the excellent district heating systems in Denmark or in the Austrian village of Gussing, and last summer I blogged about Plas Newydd in Anglesey installing a marine source heat pump. Adding large scale heat pumps into district heating systems, that might also utilize many other sources of heat, has great potential. Instead of thinking about individual houses having their own central heating systems we need to think about the best ways to heat whole towns. Large scale heat pumps have a huge potential to take heat from rivers, the sea, sewers, data centres or other sources and concentrate this heat up to useful temperatures. The Glasgow based company Star Renewables manufactures some of the largest and most efficient heat pumps in the world. 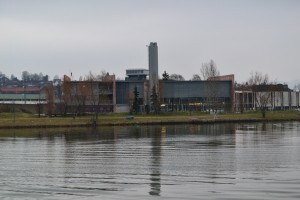 A couple of years ago they installed a 14 MW system in the Norwegian city of Drammen, which provides 85% of heating for the local district heating system, the other 15% being gas which is just used as additional heat in very cold weather. In Drammen the heat is extracted from the local fjord. Cranbrook is a new town being built in Devon that will utilize field scale solar hot water, which will heat water to 40 degrees Celsius, and then the heat pump will use cheap night time electricity to boost it to 80 degrees, suitable for the heating and hot water requirements of the rapidly growing new town of Cranbrook. This combination of technologies should mean that for every one unit of electricity used four units of heat will be produced, giving an unusually high efficiency to the system. It should also help balance electricity supply and demand on the grid by using electricity when it is cheap and delivering heat when it is needed, effectively creating a form of energy storage. Congratulations to Star Renewables: just the kind of technology we need more of! This entry was posted in Energy on 7 August 2015 by Richard. Since I wrote the last blog on Obama’s announcement for a 32% reduction in power station emissions by 2030 I’ve come across a video of his speech in full. It is one the best speeches by any incumbent political leader I’ve ever heard. Well worth watching the full 26 minutes of it! This entry was posted in Miscellaneous on 5 August 2015 by Richard. Today Barack Obama is due to announce his revised Clean Power Plan, aiming to reduce carbon emissions from power stations by 32% by 2030, compared to 2005 levels. Even this relatively modest goal will be fought by the coal industry and by Republican politicians. With the 2016 presidential elections looming a range of very divergent candidates are emerging, from the inspirational Bernie Sanders to the dreadful Donald Trump. Obama is trying to offer American leadership on climate change ahead of December’s Paris conference, and to secure his legacy. It will be up to his successor to deliver, and Bernie Sanders would be my choice for the person to do it. Technologically radically reducing emissions is achievable: it has been the political leadership that has been lacking. Ideally I’d like to have seen Obama announce an 80% target for power stations by 2030 rather than 32%, which would have been very challenging, but probably achievable. These plans announced today by Obama only relate to power stations: much more challenging is to reduce emissions across the wider economy. I’ve often written and spoken about the desirability of working toward 100% renewables for electricity, heating, cooling and transport. Many communities, from small villages to cities, states and whole countries are setting themselves this much more ambitious target, and then getting on with some excellent work in creating jobs and many diverse social, economic and environmental improvements as they do so. In USA there is great diversity of energy and environmental policy and action from one area to another, due to its decentralized democracy. Hawaii is the first, and so far only state to mandate that all electricity will come from renewables, and that this will be achieved by 2045. However it is at the city and more local level that leadership is best demonstrated. Fort Collins in northern Colorado is a city of just over 150,000 people and a couple of months ago they voted to reduce their overall carbon emissions 20% by 2020 and 80% by 2030, based on a 2005 baseline. They had already instigated the innovative FortZed plan back in 2007, on which they are now building. Lancaster City in Southern California is a similar sized city to Fort Collins and it too, like many other communities across USA, is setting local targets way ahead of the pack. These pioneering communities are setting an example for the rest of USA to follow, but for that to happen it’ll take political leadership at the national level, so who ends up as the next American president really does matter. This entry was posted in Climate Change, Energy, Global, Politics on 3 August 2015 by Richard.